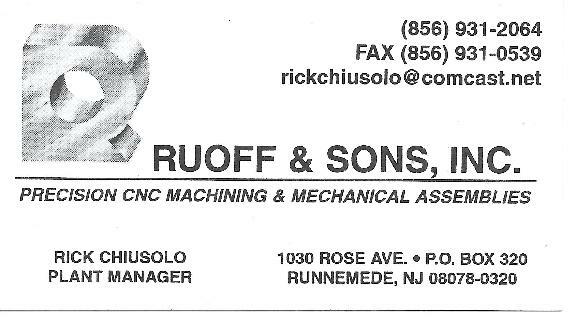 In 1951, a group of top-grade tool and die engineers pooled their proven talents to form Ruoff & Sons, Inc., a machining facility dedicated to offering discriminating customers the highest standards of quality and precision. From the beginning, they organized the company as a fully integrated operation, where all essential functions of design, machining, and inspection of finished parts would be performed under one roof and under one responsibility. The company's reputation has grown with each assignment it has undertaken. Today Ruoff & Sons, Inc., is recognized as the quality leader in the Delaware Valley, and for being a thoroughly reliable source which delivers on schedule at economical prices - even on the most difficult parts. Ruoff & Sons, Inc., does not aim to be the largest precision-machined parts manufacturer in this area - simply the best. In 1984, Ruoff & Sons, Inc., was honored when the United States Small Business Administration selected us as "Regional Prime Contractor of the Year". We were delighted by this award, but even more please by the continued association with the constantly expanding group of customers. We have a lot to offer our customers: years of diversified experience, highly qualified personnel, a prime plant location, and a record for quality and delivery performance that can't be equaled. Give us your most demanding requirements. We're ready to meet the challenge in a way that is sure to please you. Talented people and fine production equipment are the special assets that Ruoff & Sons, Inc., puts to work on your order. The personal touch starts with an analysis of your drawings by our engineers and toolmakers and continues with our design of tooling and planning of machining operations required. Each operation is then programmed on our in-house computers. We design and build gaging and inspection fixtures which assure that your desired quality standards are consistently met. The machining and inspection equipment in our shop has been carefully selected for its capability to satisfy the most demanding customer requirements. We have both vertical and horizontal CNC mills with multiple fixturing and rapid tool changing capability, which enables us to produce at high volume with superior precision and repeatability. We also have a wide range of CNC lathes and turning centers, grinders, drill presses, and punch presses. We have a full range of equipment for hot, cold and vibration test procedures. We even have an in-house paint shop. Except for gear cutting, heat treating and plating, we can do every operation your job requires in our own facility under our own control! At each of the machining centers in our unique flow-through manufacturing facility, rigid inspection procedures assure compliance with stringent standards of quality. Our CNC machinery virtually eliminates the possibility of human error in production. In addition, our personnel continuously monitor critical dimensions of parts being produced. During the production run, adjustments are made at the control console to compensate for cutter wear, and thus assure close adherence to tolerance specifications throughout the production run. During our more than five decades of precision parts production, we have developed our own inspection procedures to ensure high quality standards. We accurately define acceptable limits, circumstances and conditions for every individual part requirement. Before we place a part in production, our inspection department carefully determines that the first piece off the line meets all specifications. Every machine operator is trained to check every dimension of the part that is going through production. Each machining and assembly department conducts its own "in-process" inspection and records results in detail. Our Quality Assurance Laboratory performs separate final inspection of complete parts using computer-controlled measuring equipment, gages, optical comparators, profilometers and other standard inspection apparatus. All of our inspection equipment is checked and calibrated in a suitable environment. Technical data pertaining to measuring equipment is traceable to NIST standards. When government source inspection is required we have a suitable Quality Assurance Lab to accommodate inspections.